First and foremost, avoid giving your pets any table scraps. It’s tempting of course and even the ASPCA says a small piece of well-cooked, boneless turkey shouldn’t do any harm, but you don’t want to set a precedent for your guests who might be less discerning about what they offer your four-legged family members! Furthermore, you don’t want to encourage undesirable begging behavior by giving your pets mixed signals. Additionally, there are multiple ingredients that turkey, or another item, might be cooked with, such as onion and garlic, that could cause gastrointestinal discomfort. Stomach aches really ruin the party! The solution here is to plan ahead and get special treats that are appropriate for your pet. Numerous pet food brands offer seasonal treats that are made from turkey or pumpkin, and the latter can actually aid digestion. You can also get your beloved pet a new toy and hide those special treats in them so that they get a fun game out of the deal too. What else do you need to watch out for this holiday season? As always, you’ll want to be mindful about your décor and how your pets could potentially hurt themselves with it. For instance, many of us like to purchase candles to help create atmosphere in our homes whether it’s the holiday season or not. Keep all candles out of reach of pets and never allow candles to burn unsupervised. Even flowers from guests can be problematic, according to the Pet Poison Helpline. A scary number of popular flowers are poisonous to cats, including lilies and tulips. You might ask your guests to bring a side dish or beverages rather than bouquets, or to do a quick Google search before brining over any plants! Should anything toxic be brought into your home, or should you have any doubts about your pet staying out of trouble, consider keeping them in the family area but in the crate you’ve made into their safe place. This is especially helpful if you have pets prone to dashing or who might be overstimulated by all the people coming in and out of your holiday. Once your celebration is over and guests take off, you might think the holiday risks have come and gone too. But, it’s not over until the trash is thrown out. All of the food items and packaging you wanted to keep your pet away from ends up in the garbage can at the end of the night. You don’t want to start your morning with an emergency vet visit because somebody got curious. If you take care of the cleanup immediately after your gathering ends and you follow the rest of the safety advice above, you’ll be able to rest assured that your pets are out of harm’s way and simply got to enjoy the holiday with everyone else as you intended. That said, should you discover that something has gone wrong, we want you to know that NOVA Pets is always here for you. If you need to schedule an appointment or come in for an emergency please call us at (703) 378-9791 and we will be happy to help. 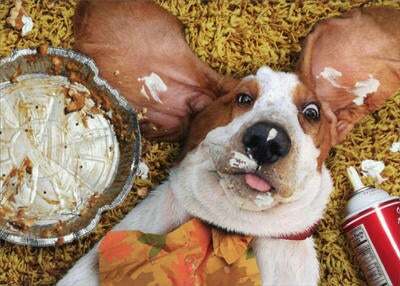 NOVA PETS WISHES YOU AND YOUR LOVED ONES A HAPPY THANKSGIVING!